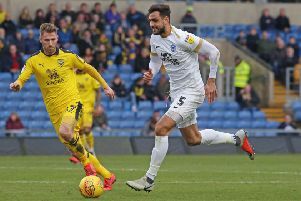 Posh defender Michael Bostwick can't believe what's happened. Well that was a boring season. Not as boring as the 1980s under John Wile admittedly, but horribly dull compared to most of Darragh MacAnthony’s 10-year reign at London Road when even a relegation was pretty exciting. Don't lose faith in Posh boss Grant McCann. ‘The Entertainers’ have become exasperating and few would have seen that coming when classy Posh playmaker Grant McCann was handed his first managerial role. I’m quite relaxed about finishing 11th in League One. It’s not a bad position based on crowd size and the club’s entire Football League history. No-one should complain about finishing well behind the likes of Sheffield United, Bolton and Bradford City. We should celebrate finishing above MK Dons, Cobblers and Charlton, and we should be grateful we are not a basket-case like Swindon and Coventry City. MacAnthony remains well in credit despite two fallow years, but his mojo needs to return to restore confidence in his club’s potential. Gwion Edwards has been an excellent Posh signing. Burton and Fleetwood have shown in the last two seasons what clever coaching, an excellent use of limited resources and players with passion and commitment can achieve. Compared to those clubs Posh have been an abject failure. Posh might have finished two places higher than last season, but they accrued a point fewer. But I don’t blame McCann. Sure he’s admitted to rookie mistakes (and his trust in the midfield diamond wasn’t always justified by performances), but he did remarkably well to get this particular squad into sixth place before Christmas and into a top-half place at the end. Strangely, for a man with McCann’s pedigree, his better signings were defensive ones (Luke McGee, Ryan Tafazolli) rather than attacking ones (with the exception of the excellent Gwion Edwards) and it was a back four and goalkeeper who did most to make us believe a play-off push was a possibility for so long. Victories were ground out rather than glorious. Posh looked disciplined and well organised when winning at MK Dons and Charlton. Edwards, whose subsequent injury was a huge blow, scored a great goal at the Valley, but there were more moments of individual brilliance than there were examples of fantastic team performances. I was unfortunate to miss the best team display, at home to Millwall in August. Any thoughts that 5-1 win would lead to improved home form - a pre-requisite of any promotion push - were soon dashed. Posh played at too slow a tempo, but more importantly failed to find a strike partnership that worked. McCann tried more than a dozen permutations, but unless Marcus Maddison awoke from his slumbers to deliver some magic, goals seemed harder to come by than in recent campaigns. We must hope Ricky Miller is the answer. With so many problems going forward, as soon as the defence faltered post-Chelsea, Posh were sunk. Most of us ruled Posh out of the play-off race well before the manager. Posh have gone stale since relegation from the Championship in 2014. Crowds are falling as interest wanes so there’s a huge summer ahead for the manager and his director of football. Barry Fry has worked miracles before. Anyone capable of getting £300k for Nicky Ajose and any cash at all for Ricardo Santos shouldn’t be under-estimated. He even persuaded Lincoln City to part with £150k to take goal-shy Lee Angol on loan this season. Despite those masterstrokes, placing unwanted players on the transfer list is the easy bit. Getting clubs to take them off our hands is far harder as Adil Nabi’s continued presence at the club confirms.